Transportation Costs > How Much Does AAA Roadside Assistance Cost? How Much Does AAA Roadside Assistance Cost? AAA roadside assistance is one of the many benefits of being an AAA member. If you have an AAA membership of any level, you are going to automatically be enrolled in their roadside service program. If you were to run out of gas or need a tire change, their professional services will be able to help you 24 hours a day. On average, all AAA memberships include roadside assistance can cost anywhere from $50 to $150 per year. The costs will depend on the type of plan that you want to sign up for. One of the main differences in the membership plan pricing is the towing packages and other inclusions such as 24-hour concierge services and higher reimbursement policies. The Premier plan, which is the best available option, offers to tow for up to 100 to 200 miles, depending on your state, for example. Even though you have roadside assistance, you may still be charged for some services. Refer to our chart below to see an average of each service if you were to call in a particular service. 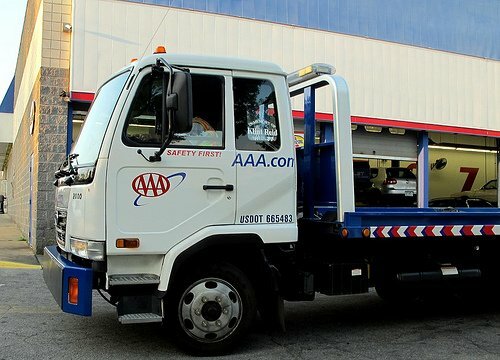 Flat Tire Service Included with membership, but if you do not have a spare, you may either need to pay AAA for one or choose to be towed to a local shop or to your home until you can get one. Included with membership. Included with membership. Fuel Delivery Just have to pay for fuel. Included with membership -- no fuel costs. Included with membership -- no fuel costs. Locksmith Up to $50 to be applied toward a locksmith credit. Up to $100 to be applied toward a locksmith credit. Up to $150 to be applied toward a locksmith credit. Towing Up to four 5-mile tows. After, $5~ per mile surcharge. Up to four 100-mile tows. After, $5~ per mile surcharge. Up to 1 200-mile tow and up to three 100-mile tows. After, $5~ per mile surcharge. AAA offers three membership plans: Classic, Plus and Premier. Each membership plan, as long as you’re a member, will include basic roadside service. All members are entitled to four road service calls per year for properly licensed and registered vehicles on the plan. AAA roadside assistance offers a flat tire service, battery service for dead batteries, fuel delivery if you run out of gas, emergency starting if you have lost your keys, spare tire change for a flat tire, locksmith service in case you lock your keys in your car, and towing for a car that is broken down. Aside from roadside assistance, the company also offers other inclusions such as passport photos, 24-hour concierge services, free car rentals and more. Adding a motorcycle and RV to the roadside assistance plan can add up to $50 per year, per person. If a new membership (family member) or car is added, a $20 to $40 fee could be applied for the year. Be sure to read your policy before signing up for roadside assistance. You may find that some certain circumstances, such as being stuck in a flood, may not be covered. Be aware: Whenever you use this service, it will be considered an insurance claim and will be placed into your vehicle’s driving history. This could make your future rates go higher. However, if you are insured with AAA, it will not go on your record. Before you choose a policy, make sure that you do not have coverage already. You may find that your current car insurance policy already covers you for roadside assistance, even if there are limits to how often you are allowed to use it. The same can be said about a car warranty. If your car is still under warranty, you could have this type of service if it was written in the contract. Compare other roadside assistance programs such as AARP and Walmart. There are hundreds of companies that can offer similar services. However, before choosing one, always make sure that you research them first before signing up. If you do a lot of driving, then signing up for one of these policies could make sense. For example, one roadside call could cost upwards of $50 to $100. If you were to sign up for a basic plan and only use it once, you could get your money back with one car tow. Be sure to check with your insurance carrier, even if you do not have assistance. Most of the time, this will be the cheapest option to consider. Check out AAA’s car insurance if you do not already have a policy. You may find that it is cheaper to insure your car with them. If you do insure your car, the membership will come included.